Do you have a split personality? Do you present one face to your co-workers and another to your buds? According to Zaphod Beeblebrox, you can't be president with a full brain. Our hectic modern life sometimes necessitates splitting ourselves, based on what is appropriate for the occasion. This sweater vest can sympathize. The front is a typical, good quality sweater vest. It's all cotton, has ribs and a v-neck, and the original tag read Banana Republic. I have taken this demure sweater vest and given it extra character by adding a filet crochet skull and bones appliqué, of my own design, to the back. Then I cut out the fabric behind and dyed the whole thing black. This makes the appliqué blend in smoothly with the rest of the vest. All of the materials used to make it were upcycled. My mannequin tells me she's female, but I believe this could be a unisex item. 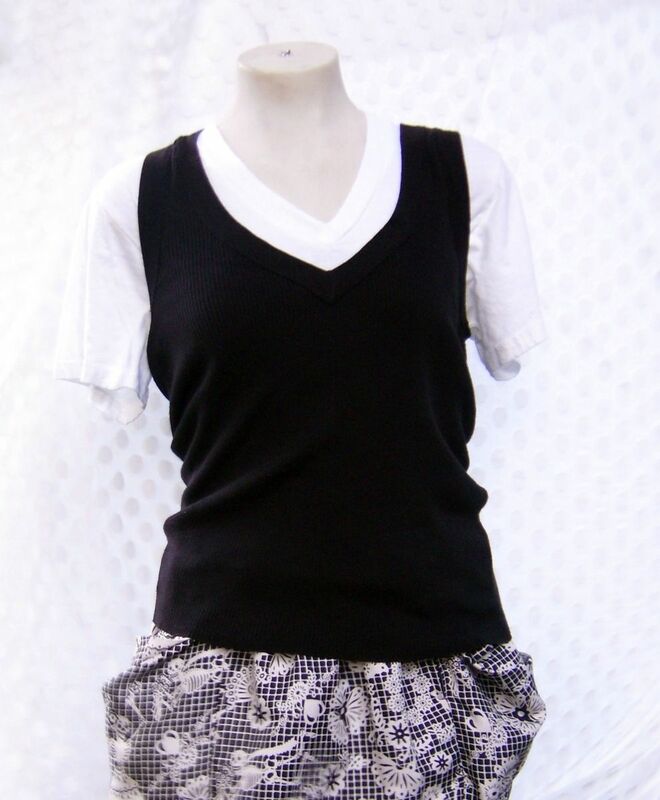 The sweater vest is pictured with the Day of the Dead skirt.